There are two unused product list blocks in Magento which can be very useful if you push a few buttons, edit few layouts ..
Other params can be left alone, but it’s up to you of course. I also labeled it Promotion just for this article. 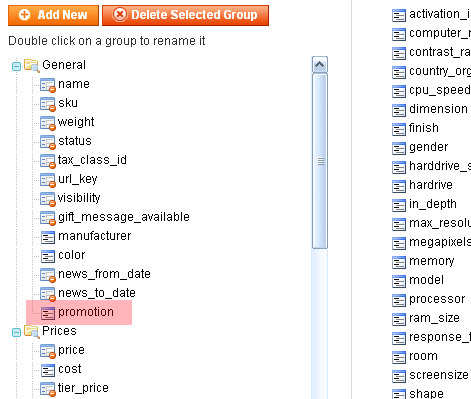 select attribute set you’re using and drag promotion to General group for example. Now when you’re editing your products, there is new “Promotion” option under General tab. 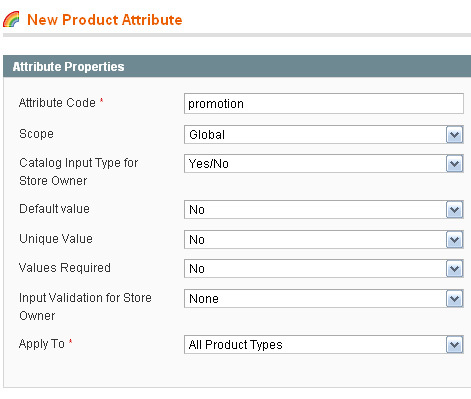 This attribute should really be included in default attribute set or in Magento sample data. This block loads random product collection from current store. since it also extends product_list block, however, since it is random product listing, that toolbar has no purpose here, so create phtml that will suit your shop needs, based on catalog/product/list.phtml. For example, i’m using similar Random block to display random products in sidebar. How can i display my single Recent Blog post on selected category landing page left side. I work with magento 1.7.0.2 and random products in my home. i got this error, any ideas? i want to display random products in catalog page of a category. This is really helpful. I have added a block that lists random products. I have tried to limit the number of products displaying in this list to 3 using the line below but it doesnt work. Any ideas? I need help placing 4 columns in the products randon. I coming back because I’ve succed to show Random Product from my catgory but not on my selected promotion product. I’d like to show Random Product from my selected promotion from my catégory:-) product_list_promotion or product_list_random but together that doesnt work. An tips for that? Thanks for the blog – I have a problem with Random. When I select “No” the product is always showed on my homepage. I know why! My question is, how does it possible to show Random Product only selected with my attribute ? Nice clue to show Random products into home page, As i do the same and it works great! thanks for tip. Here, My question is, Why it didn’t show the pagination? It seems it used “list.phtml” to show all the products but here pagination (first page, next,last page) is missing. and for the new produts how i display them randomly?? I have 4 stores and would love to show promotion products for each store specific. Right now its showing all products with the promotion atribute. This code displays a single product. 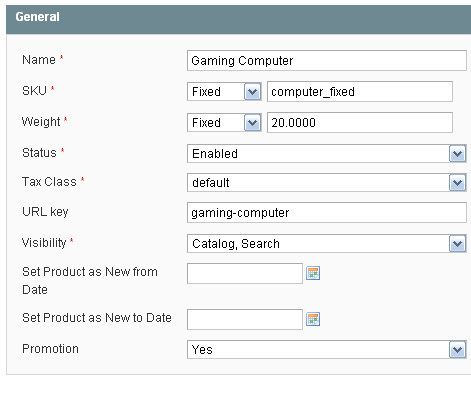 I use magento 1.5. and I want to show random products on home page. Could you please tell where on the home page information I have to put the code? on the “Custom Layout Update XML” or on the end of “Layout Update XML”?